Has a super intelligent ape destroyed Central City? That was the cliffhanger when we last saw our Justice League heroes. The evil Grodd has escaped from Gorilla City and is plotting his revenge on his gorilla brothers for not letting him take over the world with mind control. 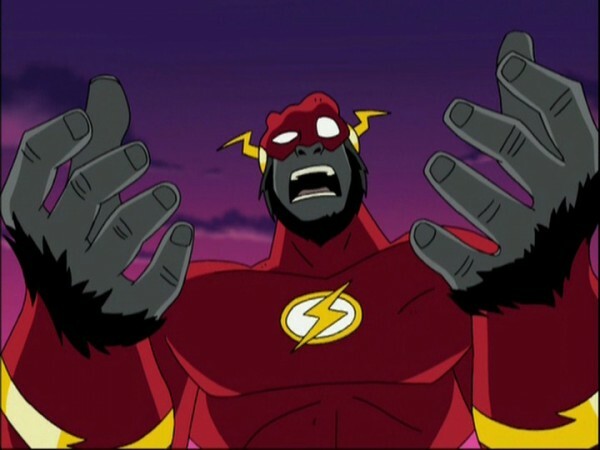 Now Grodd has fooled the world into believing that Central City has been destroyed, by using the same cloaking technology used to hide Gorilla City. Hidden safely from the outside world, Grodd can use the Central City citizens to keep Flash and Green Lantern busy while preparing the Central City missile base to launch a full-scale attack on Gorilla City. Silly? Yes it is, but we are talking about a plot line featuring super intelligent gorillas. This isn’t Shakespeare. Part one of The Brave and the Bold started out as a buddy episode with Flash and Green Lantern teaming up. However, most superheroes that team up with Green Lantern find out he’s kind of a jerk to work with. Flash, on the other hand, is always rushing in to things before thinking about them. Maybe personalities are decided by the type of power you have. Flash is fast, so he rushes in to trouble. Green Lantern is green, which is why he has a military type personality. Okay, not a good theory. Part two expanded on the team dynamics by adding the most JL team members we’ve seen in one plot since all seven worked together in the pilot episode. I was reading the comic book Justice League Adventures today and noticed how easily the writers of the comic book were able to get all the team members involved in the story. At least Bruce Timm and his team tried harder this week, as the only odd man out was Superman. Overall, Brave and the Bold was a very good story arc. I’m not big on talking gorillas, but call me old-fashioned. I bet the kids watching loved it.